Part 1 of a trilogy of works that responds to political conditions in the US since 2016. See Parts 2 and 3. “Music serves for us as a conduit to the ineffable,” French composer Olivier Messiaen once said. 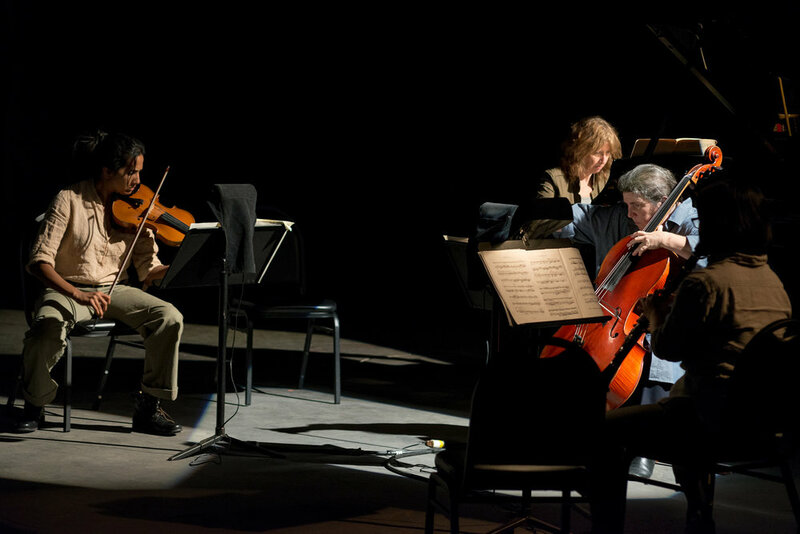 In an unsettling time of political and social uncertainty, Silton’s presentation of Quartet for the End of Time asserts the power of music to capture nature, social/political upheaval, the breadth of humanity, and the significance of reframing artistic works from the past in order to reflect on the present. In such times, music can perhaps elicit, identify, or explain the full range of human emotions when words alone seem to fail. In 1939, at the onset of WWII, the thirty-one year old Messiaen was drafted into the French Army, and was eventually captured and imprisoned as a POW in Stalag VIII A, at Görlitz, Germany. It was here, on January 15, 1941, in the camp's theater barrack and amidst bitter cold, that Messiaen’s composition, Quartet for the End of Time (Quatour pour la fin du Temps), first premiered to an audience of prisoners and German prison guards. Prior to his capture, Messiaen had begun to compose, in 1940, what would become one part of Quartet while stationed in Verdun. There, he also met and befriended cellist Etienne Pasquier and clarinetist Henri Akoka, who were to become fellow prisoners at Stalag VIII A, and who, along with a fourth POW, violinist Eugène Jean Le Boulaire, comprised the quartet of musicians who first performed Quartet for the End of Time. Messiaen, a devout Catholic, was less interested in “the end of time” as an apocalyptic overlay than as a temporal and faith-based one; he found inspiration for the work in a passage from Revelation referencing the collapsing of time into eternity (“There will be no more Time”). But the oppressive conditions within which the work was conceived and presented—set against the backdrop of wartime conditions in Nazi Germany—contribute to the work’s broader narrative and reception. It is because of this context that Silton felt compelled to present Quartet, which she began listening to soon after the 2016 US Presidential election. Citing the alarming connections between past and present conditions, especially vis a vis the targeting in the USA of individuals on the basis of religion, race, and/or gender, Silton has referred to the work’s “sense of urgency as well as its mournful acceptance—the coexistence of resistance and resignation, anger and calm.” Silton regards the work’s religiosity in a more secular light in the current political geography; in presenting this composition she intends to hold a space for people to jointly experience the breadth of emotions laid bare by Messiaen’s music, and to insist on remembering time, on remembering history, at a moment when history and historical work are under constant assault. Key to Silton’s staging of the work is the use of a non-traditional venue for presentation—industrial, cavernous warehouse space—which makes the space itself a primary character in the work, as was the case with the composition’s original context. Silton sited Quartet in a warehouse that was at the time for sale in the heart of downtown Los Angeles’ thriving art district—an area that has itself been a contested site with respect to issues of displacement, gentrification, and invisibility. As part of the performance of Quartet, Silton invited LA-based choreographer Flora Wiegmann to create a spare score for four dancers, and chose to stage the work with an all-female cast of musicians and performers, in stark contrast to by, and for whom, it was first performed.